Win a trip to Santa’s North Pole Wonderland! 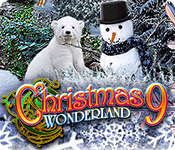 Christmas Wonderland 9 is rated 4.2 out of 5 by 54. 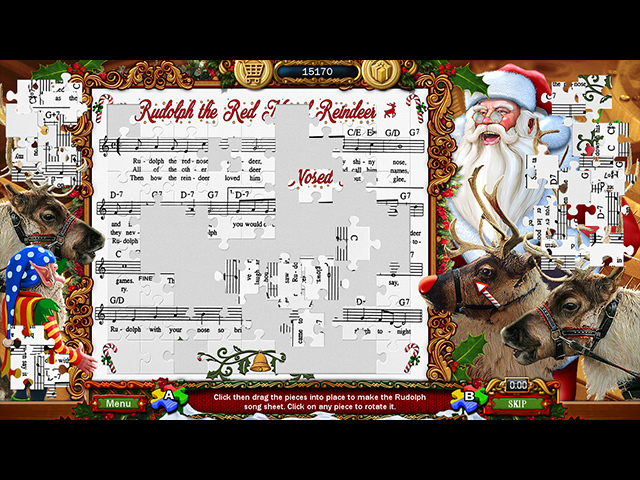 Rated 5 out of 5 by hoot51 from Chritmas fun Great game for all ages. You really have to be focused on the object to fid it sometimes. Rated 5 out of 5 by c2camfan from Excellent Game As usual Casual Arts does not disappoint in the Christmas Wonderland series (or Park Ranger and Cruise Director). These are all great series to just play a casual, wholesome, family oriented game. I especially liked the Santa in space scene. Was a nice change up. Rated 5 out of 5 by hydrokitty from Love these games. I can't wait for the Wonderland, Forest Ranger and Cruise Director games to come out. These are the most fun and relaxing games and not just for children!! The colors in the scenes are realistic and the games range from simple to reasonably difficult. I love the "achievements " feature on all of them.....makes games more challenging to play over and over again. Rated 5 out of 5 by J9CT from Christmas Wonderland = Christmas!!!!! 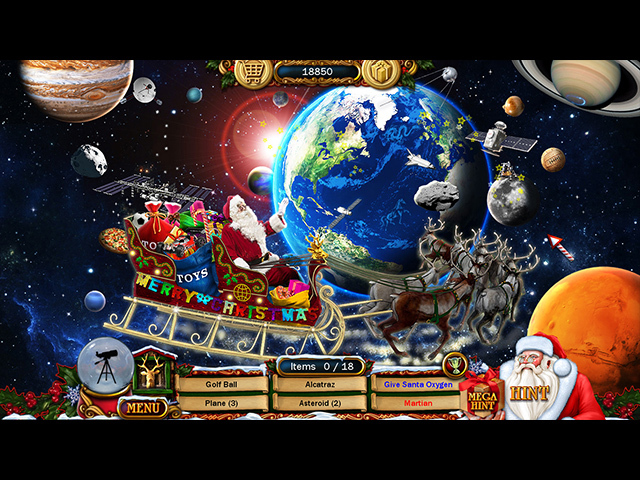 The christmas wonderland games are perfect for the festive season but also great to play throughout the year. I just finished playing this one and I really enjoyed it. I found #8 quite boring as it seemed to be a rehash of the previous games in the series but I found #9 to be fun, some puzzles a bit challenging and sometimes I needed the hint or multiple hint for the HOS. The music is also wonderfully christmassy. If there's going to be a #10 I would suggest a new family though, living in a different type of house in a different area all together. This will at least give the game a different spin for next christmas. Rated 5 out of 5 by colorsplash from Another Chritmas Hit i am not a patient person when it comes to puzzles and therefore I LOVE Christmas Wonderland 9. Just as much as I loved 8,7,6 etc. Challenging enough so its fun, not aggravating at all. lots to look at , plenty to do and nothing impossible or too tiny to see. Even the things I missed were there. I just missed them. Anyhow it is Xmas afternoon, no kids, no family, both Hubby and I have colds, what a great way to pass the day! Thanks again BFG! oh by the way the Xmas tree jigsaw was a great puzzle. Loved it. Never realized until the very end that the little gear buttons show a competed picture. Er duh! Full 5 stars! Rated 5 out of 5 by dlcoyte from I think # 8 was the best actually OK ... I bought this and ALL of the rest to this series.. THis I demoed... THe rest no... #3 was horrid.. small and not clear... THIS one is sharp and nice... love finding the extras! BUT as one person pointed out... If you use the mega hint... It last about an 1/8th of a sec and you have to wait for hint recharge... IT does not give you enough time to spot more than one item.. I used it once, so no biggie for me.. ACTUALLY, Even if I do not use it... For it not to work well is a pointer!!! LOVED the game otherwise... and YES they are repeating a few bits of the scenes here and there! Rated 5 out of 5 by cindymomof4 from Love these games! 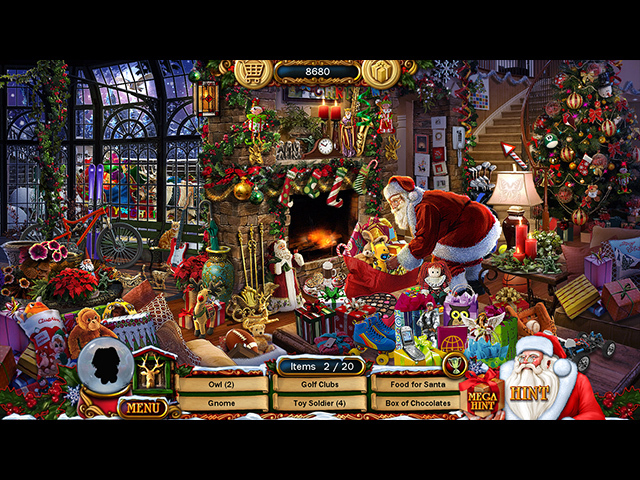 This is the type Hidden Object games I love! I don't have to worry about going back and forth into different rooms trying to solve some mystery, don't have to worry about inventory, etc. Just get to enjoy each scene with great details and graphics. Wait all year for these games...wish they could do them for ALL of the holidays! Rated 5 out of 5 by denniann2 from another wonderful game just like the other ones. get your glasses out because the items are small sometimes. hard to spot when they are in sight. i always enjoy the story. i play on casual level so i don't have any trouble. Rated 5 out of 5 by Kikime from Favorite Series of all time I love that every aspect of Christmas culture is included in the story. Reality and fantasy are blended with high values and family playability. The music is perfect for setting a cheerful festive mood. I love the sound effects, like with the finding of golden deer. I like more than one type of item list in searches. This is perfect for dividing responsibilities amongst two or three people for non-competitive play.The puzzles are beautiful, novel, relaxing, and engaging. I do find some things harder to find than others. For instance, I did not enjoy looking for the mouse, which wasn't especially cute for one. My favourite, so far has been the page of carrots in the reindeer shed, but they all have been quite neat. I like my tiny bibles and crosses. The one thing I miss, that I haven't seen for a very long time, is the fastly flashing image hidden somewhere behind the screen that, once found, and clicked on, stops in either a plus points decal with a "yea!" or other triumphant cheer or a minus points decal with a scream or "oh-no" or "awww..." I can't stand that that's no longer included in these games, (not even in the Halloween version) because that is what got me hooked on this series in the first place, not that there isn't a lot more than that in the games to appreciate, but what happened to that extra thrill that was so much more fun than anything else is? Can it be brought back? Or something similar attempted? Because I would love that.